I love to cook, I have one bookshelf totally dedicated top to bottom to cookbooks. I love to plan what we eat, carefully choosing the best ingredients, and can’t wait to get in the kitchen with those ingredients and see what I can create. I love the whole process of getting food from recipe to reality. It is something I take great care with, I am purposeful about it. 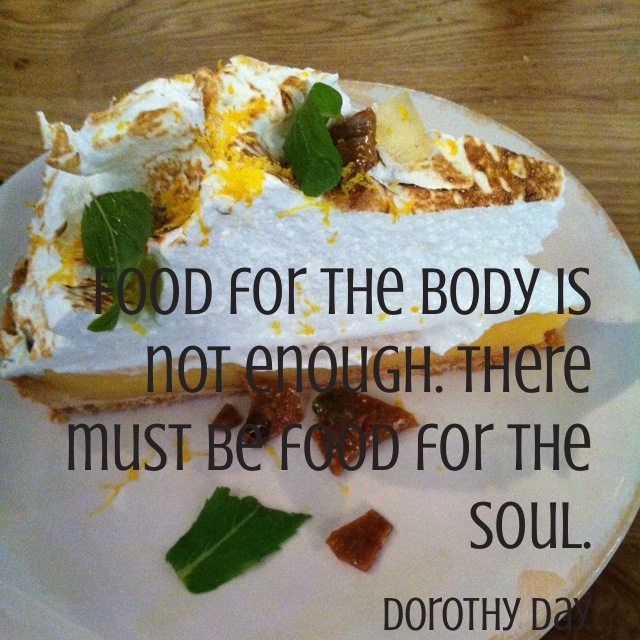 Yet over the last few months I have realised there is another sort of food I need, and that is food for my soul. I need to be planning ahead, actively searching for the right ingredients, and creating the time and space to feed my soul. At the moment I am in a weird pattern. A pattern where I focus on ticking off my to-do list, or I focus on the house, or the family. Then, when I realise my soul is starving, I feed it junk food. I feed it a multitude of different voices from other people’s blogs. Food that gives a little nourishment but not enough. I am feeding it with quick pre-prepared meals that have no depth of flavour, no sustenance. Yes they are good for a quick easy feed, but my soul needs something more substantial, more life-giving. My particularity about food makes me rather difficult to live with. Sometimes when Mr asks what I want to eat, I will reply with “I don’t know”. Then follows a list of useful suggestions from Mr, and a chorus of “no, not that” from me. I often find I am more clear about what I don’t want to eat than what I do. I am in this situation, at the moment, with my soul food. I know I am sick of existing on a myriad of daily blog posts. I know I need something more, but I’m not really sure what. I have a feeling that just sitting down to write this, might be part of the answer. PS: Just so you know, I love blogs, I love reading and being inspired by others. The problem (for me at least) is when they are the only food for my soul. I get what you mean – totally!